After working on negative pull ups for around eight weeks, the time finally came when I did a pull up! In fact I did a pull up on a campus rung, on a bar, and just to make sure I did one last one on the nice holds of a Beastmaker. It was all with close grip but it was awesome, and there will be video footage to follow! It’s still a difficult motion to do as I can still feel the sticking point, but now I can just about push past it. I think a mixture of climbing twice a week, plus working on negative pull ups has helped strengthen and hone the muscles required to pull myself up. It feels good to reach a goal after working at it for so long, I’m still psyched about it a week later! Knowing I can haul my body weight up has defiantly boosted my confidence on the wall. So what’s next in the pull up adventure? If you’re working on pull ups, keep going and it will happen. I’ve been avoiding these like the plague since I started climbing, which is now two and a half years. Resting heels I’m fine with but the active heel hooks, used to propel yourself up the wall, I find unnatural and scary. I never quite trust myself, and as soon as my heel hits the hold I’m convinced my ankle will snap. However, at the weekend I managed to conquer the heel hooking fear and I’m still alive to tell the tale, all limbs in tacked! Being scared of using my heel resulted in me overusing my arms, to the point were I would end up locking off. The pure fear of ‘death by heel hook’ somehow gave me super strength to pull up and lock off. As impressive as this is at the time, all it really does is make it harder to use the heel, and ultimately puts myself at a higher injury risk. Having my heel on the hold but not engaging it makes it unstable and therefore more likely to come off. So in the process of trying to not come off the wall, I would make it even more likely to happen! I also found it difficult to wrap my head around how you move upwards via a heel. It’s been explained and demonstrated to me so many times, but I could never connect the movements. For some reason when Marcus (A Boy Who Climbs) explained it yet again for the 3012584 time: “Put your weight on your heel and move your other leg out to open your hips” the penny dropped. This explanation finally made some sense to me, as it generated the mental image of flattening yourself against the wall, by weighting your heel and moving your other leg out. As you can see in the video, I didn’t go far but it worked and I felt myself move upwards which honestly caught me off guard! I’ve come to the conclusion that the main reason for all of the unease was down to not understanding the mechanics of the movement, so that’s something I can look for next time I get stuck with something in climbing, skating or life in general. It’s a big personal achievement to use an active heel hook, and if you’re struggling with it then just know that not everyone finds it an easy or a natural movement. Confidence, trust and time will get you there, along with some solid practice. Hope this helps! I have started to see things in a whole new light. So after dinner last night, I went over to the park with A Boy Who Climbs to investigate the boulder. Naturally we had a little climb on it too! Firstly I was really surprised by how authentic it was, the texture is great and somewhere in between an indoor hold and real rock. As you can see from the pictures, this boulder has some great angles and is packed with pinches, crimps, jugs and a bunch of interesting details. It’s obvious a lot of time, knowledge and money has been put into this rock feature. There are so many climbs you can plot on this one boulder, I’m planning on going back with my chalk bucket and climbing shoes at some point very soon. I can see this becoming a great venue to have a fun session on over the Summer. I was considering taking some more photos at some point to visually show any problems we end up making on it too. There are already some lines set which you can find here on the UK Climbing website if you’re interested. I think these boulders are becoming more common across parks now, and if there is one near you, you should definitely go and check it out. You might be pleasantly surprised by how good it is! I’ve been practicing negative pull ups for about four weeks now. Although I’ve not been as consistent as I would like, I have started to see some improvements. I can actually do a full negative without flared elbows, I just imagine trying to bend the pull up bar into a ‘U’ shape. Thank you to ‘@adventurepursuitsptandsp’ on Instagram for this visual aid, it really helped! In fact I can perform 2-3 negatives with fairly good form before it feels like my arms are going to fall off, which is definitely a huge improvement from a wobbly, half negative. I’ve pasted together the first and most recent negative pull up videos, and during the edit I was shocked to see how slow I was going at first! I think it was because I didn’t feel controlled, but now it’s much easier. The next crux is towards the end of the negative, which would be the start of a pull up. I can jump into that position and pull up from there, I can even get a lock off! However getting that initial engagement to pull me into that position is the hard part. A Girl Who Skates…Kind Of! After watching ‘Whip It’ a few years ago I became pretty interested in roller derby. So last month when I discovered there was a local team taking on fresh meat new skaters, I signed up. It was a brave moment that quickly dissolved into panic when the first day of training came around! But like most things in an anxious mind, the situation is never as bad as you imagine it to be. Skating is tricky and the training has been very challenging, I was not prepared! Yet I love it as much as climbing. Since skating is all about your leg and core strength, it’s easy to see how working these skills can benefit bouldering, and I have definitely seen some positive changes. I feel much more confident in my foot placement, especially with high feet. Plus I notice I can tense and steady myself if I pop off the wall on an overhang/roof problem, and bring my feet back up to carry on. Small things, but they have made some big differences. Also, I’m not familiar with having set times and days for a hobby, as with bouldering I just turn up and climb some stuff whenever I feel like, but I’m enjoying having a schedule. Once I get sorted I think I’ll plan fixed bouldering sessions too, as this has given me the motivation to start taking things a little more seriously. I think joining roller derby has been a big confidence boost overall. I realise that this post is slightly off topic, but since it has had an impact on my climbing I figured I would share. The conversation all started from talking about our weekend climb at Kendal. I absolutely loved the training board pictured below, I even caught a quick clip of me climbing it on my Instagram feed. 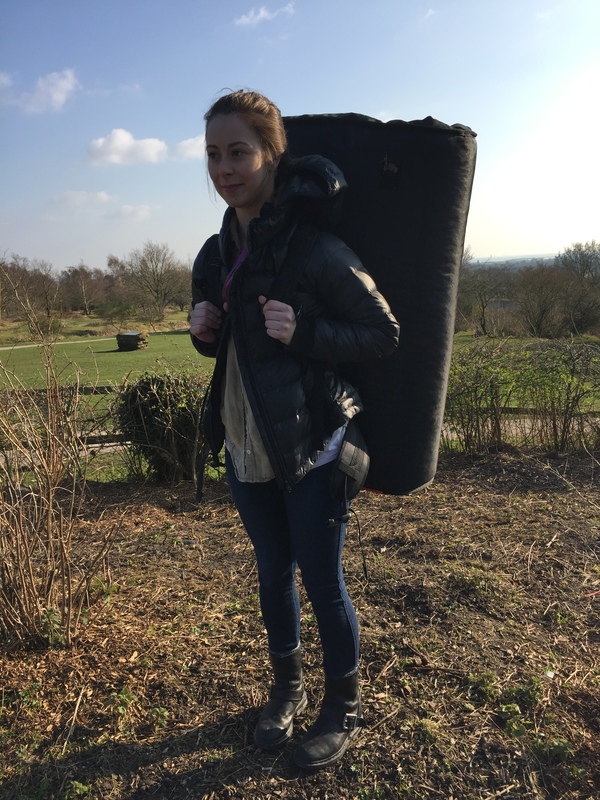 It was kind of like a home climbing woody packed with great holds and movement, it made me want my very own! I spent more time playing on the problems set on that board, than I did bouldering in the whole centre. The angle was deceiving as holds were further away then they first appeared, and it was steep enough to make you work for each move. It wasn’t particularly high which made me feel happy to try harder because I wasn’t scared of falling. I was as surprised as anyone when I flashed a few problems, but I guess it was because I had found my prefered climbing environment. Instead of accepting the congratulations, I made excuses such as: they were good holds, it was a short sequence, it’s easy because I’m shorter etc, to which A Boy Who Climbs told me off. I think I find it hard to recognise achievements because I feel unbalanced in my climbing abilities, and it seems to make everything feel muddled. I’m genuinely not bothered about what grade I climb, but I would like to know where I currently fall on the scale. This is what I find difficult to grasp and nail down. After much discussion he ended up breaking down and grading my skills so I could understand a bit better of how he saw me as a climber, instead of how I saw myself. Having someone assess my climbing from outside my own brain was super helpful, as it’s easy to beat yourself up and not acknowledge when you do something great and strong. From this it’s also easy to see my biggest weakness and strength. Working on my confiednce and movemet will hopefully help me level out so I become a well rounded climber. I’m still not sure what I’m capable of and I know it’s going to be a long journey. Out of everything, confidence is the hardest thing to train and the only way to do it, is to do it! It could be worth asking your climbing partner or someone close to break down your climbing elements in this way too. I know so many people and climbers who find doing a pull-up easy, but no matter how hard I try I just can’t seem to engage the correct muscles in my back to make me go up! However, I like to think there’s no reason to be discouraged by not being able to do something, even if it feels impossible. I’m sure you’ve seen ‘Magnus Midtbø: The One Finger Pull-up’, the Norwegian climber performs some crazy training sequences I previously thought to be impossible for any human. Go check it out if you haven’t seen it. I don’t think there’s much point getting to complex, so I’ll see how it goes with these. Naturally there will be some clips and photos of my progress over on Instagram and Twitter, but I’ll be back in a couple of weeks with a blog post on it too. Any advice is welcome, just leave it in the comments. I love scrolling through Instagram and having a look at all of the #Bouldering videos on my lunch break. I’ve even shared some of my own climbs on there too. Filming yourself climbing is such a great tool for improving, and something I would never have thought of doing at the start of my bouldering adventure. In the latest clip I shared, I was reaching the hold but struggling to keep the contact. If you could have asked me at that moment what it was that was preventing me from sticking the hold, I honestly could not have told you. It just felt like it was there but then it wasn’t, a little frustrating overall. However, after watching myself back a couple of times it’s easy to see my right foot turns in causing my knee to face the wall, which results in pushing me away. Sorry for the crummy video quality, I didn’t expect to write a post on it! This mini revelation has stuck with me and on my most recent climb (at a different gym) I was more conscious of my foot placement, which resulted in some good progress. So if you’re struggling with a project or certain move and you’re not quite sure why, try recording yourself and see if it helps. Sunday it finally happened, I got to climb outside on real rock for the very first time, and it was awesome. 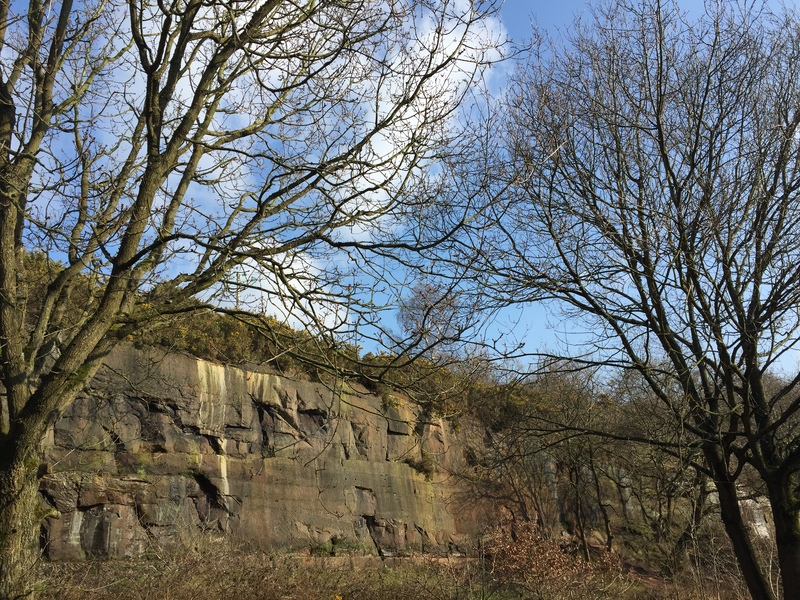 After watching the weather all week I was so excited to be able to head down to Pex Hill, which is the local crag I previously wrote a little post about which you can read that here. Late morning we headed down to meet up with some friends. Having no idea what to expect I was scared at first because it was all outdoorsy and there was a much smaller crash mat under me than I was accustomed to. It took me a few tries to get use to holding rock instead of plastic, but I started to settle in and understand why there is so much love for climbing outside. There was something so lovely about being surrounded by trees, the fresh air (or as fresh as Widnes gets) and having such a good bunch of people to share it with. As more people started to arrive the atmosphere became exciting but calm in the perfect balance. Maybe it’s because the quarry is sandstone but it was so much gentler on my skin, there’s just something better about climbing on real rock. Other climbers were also at the quarry, and rightly or wrongly I was shocked to find our groups fusing as we climbed problems near one another. Crash pads and chalk was shared, along with beta and support. It was an experience I didn’t expect, but one I’m glad I was part of. I only played on bouldering eliminates on Pisa Wall, and had a crack at Poor Leno, Trad Sit Down and Gorilla. After a while I just joined in with whatever was being climbed as the grade didn’t matter to me, which is probably a good thing as the problems don’t seem to correlate with the guide book. 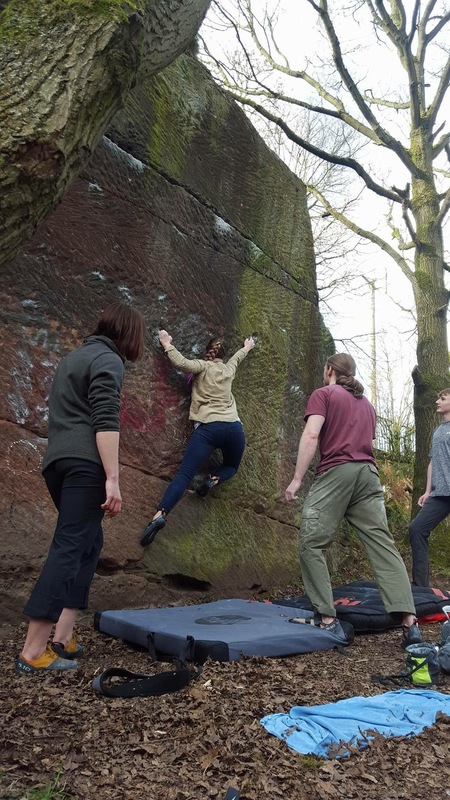 The element I struggled with was foot placement, mostly because 99% of the handholds at Pex Hill are old bullet holes. It was tricky remembering to work my feet up, as I’m used to whacking it on a coloured piece of plastic. At the same time it was easier because I could find a small pebble to step on that others wouldn’t deem useful. Hands down that was the best climbing experience I’ve had to date, and has made me love the sport even more. I can’t wait to get back out there, hopefully with my camera to grab some footage. Any questions or advice on where a newbie should climb next within the north west is very welcome!